After purchasing and realizing just how delicious (and so much better) fresh mozzarella cheese is, we’ve been buying it quite frequently. I can’t remember which recipe I bought it for initially, but the store only had the larger 6 oz. variety of mozzarella. I only needed two or three ounces for my recipe so I knew I needed to figure out something else to do with the mozzarella before it went bad. And then I came across roma tomatoes on sale in the store. My brain immediately went to the incredibly awesomely delectable white pizza I had from our local Italian place and the idea to make a margherita pizza was born. Unfortunately it took another week or so before I was actually able to make this pizza due to a disappearing pizza pan and having pizza for lunch one day at work. 1. Preheat the oven to 450. Sprinkle a light dusting of cornmeal on your pizza pan/stone. 2. Roll out the pizza dough into a circle. Brush with the melted butter and then sprinkle the garlic, oregano and crushed red pepper on the dough. Bake for 8-10 minutes or barely browned. 3. Remove the pizza from the oven. Sprinkle the shredded mozzarella cheese and Parmesan cheese over the dough. Arrange the tomato slices, mozzarella rounds and basil leaves on top. Season the tomatoes with salt and pepper. Return to the oven for 8-10 minutes more or until the cheese has melted and the pizza is crispy. Oh my. 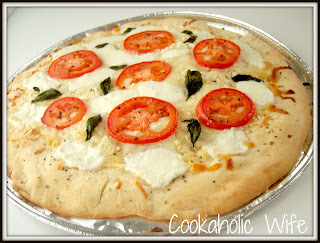 What in the world was I thinking all of those years when I refused to eat pizza with fresh tomatoes on it? The smell of this cooking is just absolutely wonderful. The butter and garlic combined are just heavenly enough on their own, but add in the sweet smell of roasting tomatoes and fresh basil and your nose should just sing with happiness. As much as I love trying out different pizza combinations I really think I’m going to have a hard time not making this pizza each time instead.